The earfold is a new technique for correcting prominent ears. It is an implant which is introduced through a small incision on the front of the ear. 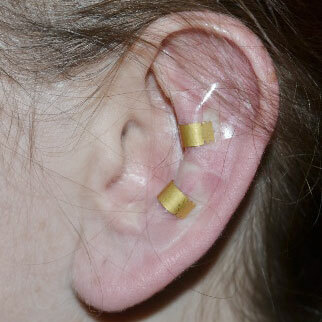 It is placed on the antihelix part of the ear, grips the ear cartilage and immediately adopts a pre-set shape. 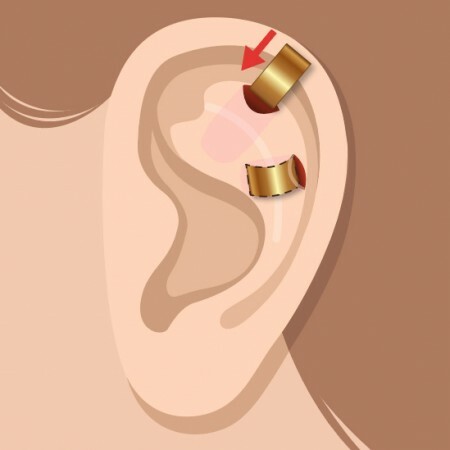 The earfold consists of a thin strip of metal (Nitinol) plated with 24 carat gold. Its insertion is a quick procedure performed as an outpatient requiring minimal dressing. The earfold is very effective tool and simple to apply. It is, however, not suitable for all types of ear prominence as it only has one mode of action which is to fold the antihelix of the ear at a preset strength. It can only be applied in cases where folding the antihelix at a specific point gives the desired look. Also it has no effect on the conchal cartilage (the bowl of the ear) which in some cases also contributes to the prominence. You will be advised by Mr Sabbagh of your suitability for the ear fold after full assessment and trial with an implant that is placed above the skin to simulate its effect (see image above). One or two small incisions are made. The implants are inserted flat, they then spring back to their natural curved shape, which bends the ear back against the head. Earfold is an implant created to correct prominent ears by reshaping the anti-helix. It is introduced through a small incision under the skin of the ear and grips the ear cartilage and immediately adopts a pre-set shape. The earfold is made from Nitinol alloy (titanium and nickel). The implant consists of a thin strip of metal plated with 24 carat gold to limit its visibility through the skin. No dressings are needed following correction and return to most activities is possible after one week. Insertion of earfold implant is a quick and easy procedure performed under local anesthetic. 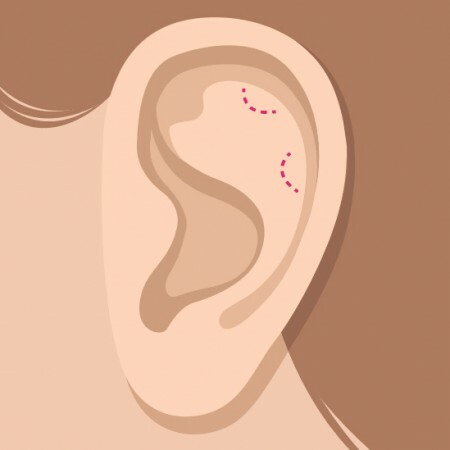 A small incision (5mm) is made within the rim of the ear and the implant (which is pre-mounted on an introducer) is released to correct the prominence. One or two dissolvable sutures are needed to close the incision. The earfold implant is designed to re-shape the antihelix. If the prominence of the ear is primarily as a result of conchal bowl prominence then the earfold will not correct this and a different surgical procedure will be required. No bandage is necessary following earfold insertion. There will be minor bruising and swelling following its insertion which will subside over a period of 2 weeks. The implant itself has no associated health risks. The implant can be felt under the skin and is almost invisible. There is a very small risk of infection and in the majority this settles with antibiotics. 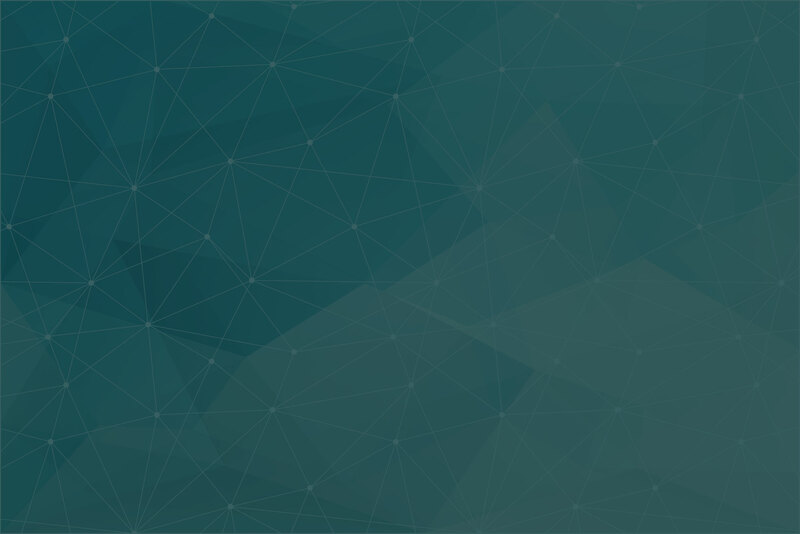 In rare situations (<1%) the implant may come through the skin. If this happens then the implant has to be removed and the skin heals without any problems. The ear prominence may re-occur after this, especially if this happens within 6 months of insertion, and thus a further procedure may be required.